Paul: Bankrputcy is an option for U.S.
NEW YORK (CNNMoney) -- How should the United States deal with its growing debt problem? 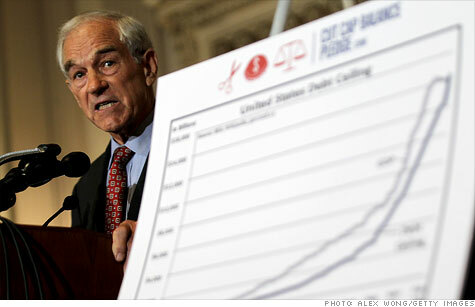 Ron Paul thinks declaring "bankruptcy" might be a good idea. The Texas congressman and Republican presidential candidate was discussing Greece's fiscal trouble with Iowa radio host Jan Mickelson on Monday when he was asked, "If bankruptcy is the cure for Greece, is it also the cure for the United States?" Of course, sovereign nations can't declare bankruptcy the same way a corporation might. Instead, the government would be unable to fulfill its obligations, and would stop making payments on its debt, resulting in a default. Greece is currently embroiled in a debate over how to pare back its social programs and government spending to secure another bailout for paying its debts. Paul said social programs -- medical care and other benefits -- have pushed Greece to the edge, and the United States should take note. "The big message there is the fact that the people who are seeing they are losing their benefits and their free medical care and all, are rioting in the streets," Paul said. "That is the problem, and we are not immune from that." Paul -- known in Washington for his renegade economic ideas -- wants to convert the U.S. monetary system to one based on the gold standard, and held a hearing last week to grill federal officials about his bill to audit and inventory the nation's gold reserves. The Texan is no fan of the Federal Reserve either, and suggested Monday the United States should eliminate the Fed as a way to reduce the deficit. "We owe, like, $1.6 trillion because the Federal Reserve bought that debt, so we have to work hard to pay the interest to the Federal Reserve," Paul said. "We don't, I mean, they're nobody; why do we have to pay them off? However, the Fed returns the interest earned on those holdings to the federal government. Last year, the Fed sent $79 billion to the Treasury. On the debt ceiling, Paul said the most likely scenario is that lawmakers pass a series of short-term increases of the nation's borrowing limit. And he said that if the U.S. were to wipe out the debt owed the Fed, investors would gain confidence. "They'll say 'Hey, they've just reduced the deficit by over a trillion dollars, now they can handle it. They can go back to meeting their other obligations,' " Paul said. "It might give some reassurance to the market."